Huur de avontuurlijke Top Hunter arcade game. Klassiek spel met veel levels. Neogeo arcadespel. Probeer tegenstanders aan te vallen met allerlei voorwerpen of gebruik je mega lange arm. Spel staat op free play en heeft Neo geo cassete voor div. spelen. 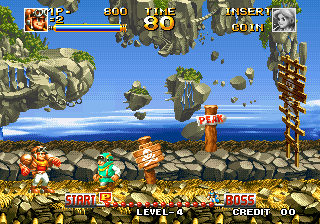 Top Hunter: Roddy & Cathy is a side scrolling arcade platform game developed by SNK for the Neo Geo in 1994. It was also released on the Neo Geo CD, and the Wii Virtual Console. done by moving the joystick in certain directions and pressing the attack button, similar to Street Fighter and King of Fighters fame. The game is split into four planets: Forest, Ice, Wind, and Fire. Depending on what stage is picked first, the layout of the stage will change. For example, if the player picks the Ice world before the Forest world, the Forest world's beginning layout will be different. The galaxy's top bounty hunters Roddy and Cathy are sent to put a stop to a colony of Galactic Pirates called the Klaptons who threaten and plunder the cosmos. Four high members of the colony have taken control of four elemental planets. Big rewards are offered for the captures of Sly, Misty, Mr. Bigman and Dr. Burn. The top hunters battle their forces and destroy the bosses' war machines but they all get away. defeat the four bosses again and take care of the captain once and for all.